Georgetown Nature Area - NATURE FEST 2011 SATURDAY, MAY 79:00 AM - 5:00 PMEVENING BENEFIT CONCERT 7-10 PM Press Release April 1, 20118th Annual Georgetown NATURE FEST withMUSIC, ART & NATIVE CULTURE The Nature Area in Georgetown, California, will be hosting their annual family event Saturday, May 7th from 9am to 5pm. Please join us for a wonderful day of art, food, music celebrating Nature in the Nature Center’s forested amphitheater, northeast of Sacramento off of I-80. The event includes free nature education, arts and craft activities for children with performances on the main stage by: Kimberly ShiningStar, Otsigeya, Gvwi, Loping Wolf, 3 River Drum, Nakai Family, Maidu Language Class, local students, and many others to be announced. Special appearances will be made by our Benefit Concert headliners. Opening ceremony at 9:00 AM at the amphitheater with Rick Adams, Nisenan Cultural Specialist, and Dennis Yonemura, Native American Spiritual Leader with Miwuk Dancers. Naturally Native- Women at the Drum will be hosting a women’s drum workshop at 10:00 AM at the village site. Information booths, food and Native handmade crafts will be available during the day’s festivities. 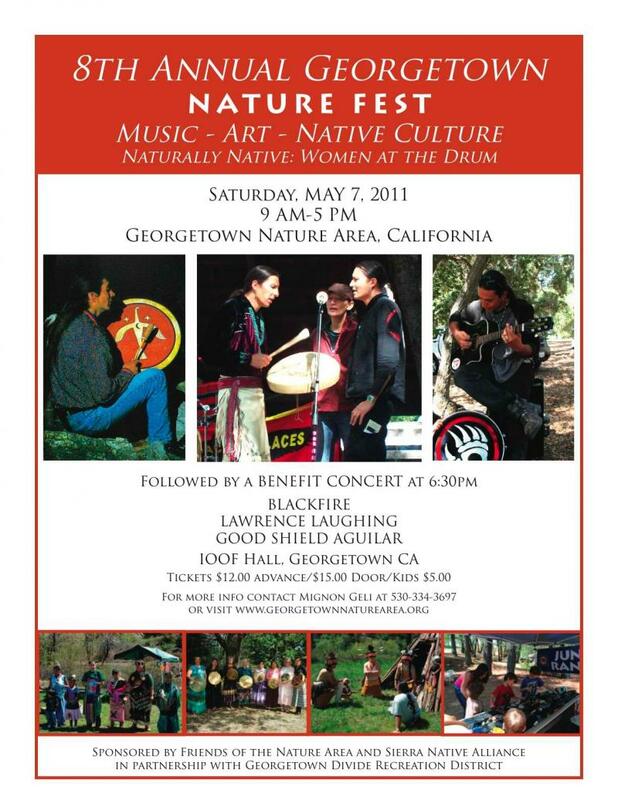 A benefit concert for the Nature Area featuring Blackfire, Good Shield Aguilar, and Lawrence Laughing will follow at the I00F Hall in Georgetown at 7:00 PM that evening. Doors open 6:30 PM, raffle and refreshments. Advance tickets $12.00, at the Door $15.00; Youth Under 21 $5.00. For further information please contact Mignon Geli (530) 334-3697 or mignon@georgetownnaturearea.org or visit www.georgetownnaturearea.org for a schedule of events and directions. Sponsored by Friends of the Nature Area and the Sierra Native Alliance, in partnership with the Georgetown Divide Recreation District. Kimberly ShiningStar, Otsigeya, Gvwi, Loping Wolf, 3 River Drum, Nakai Family, Maidu Language Class, local students, and many others to be announced. Special appearances will be made by our Benefit Concert headliners. Opening ceremony at 9:00 AM at the amphitheater with Rick Adams, Nisenan Cultural Specialist, and Dennis Yonemura, Native American Spiritual Leader with Miwuk Dancers. 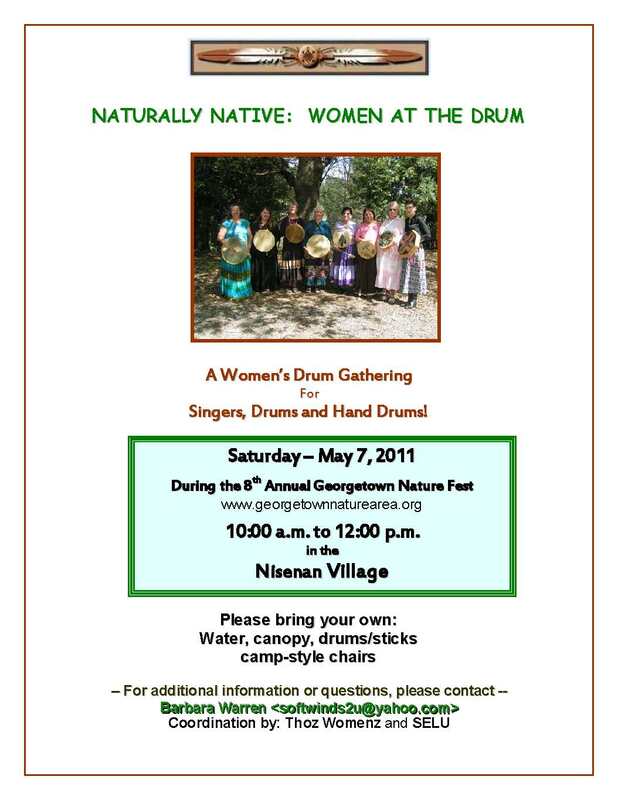 Naturally Native- Women at the Drum will be hosting a women’s drum workshop at 10:00 AM at the village site. Information booths, food and Native handmade crafts will be available during the day’s festivities. A benefit concert for the Nature Area featuring Blackfire, Good Shield Aguilar, and Lawrence Laughing will follow at the I00F Hall in Georgetown at 7:00 PM that evening. Doors open 6:30 PM, raffle and refreshments. Advance tickets $12.00, at the Door $15.00; Youth Under 21 $5.00. For further information please contact Mignon Geli (530) 334-3697 or mignon@georgetownnaturearea.org or visit www.georgetownnaturearea.org for a schedule of events and directions. Sponsored by Friends of the Nature Area and the Sierra Native Alliance, in partnership with the Georgetown Divide Recreation District. EVENING CONCERT TICKETS ARE AVAILABLE NOW! 530-334-3697. "Georgetown Nature Fest", PO BOX 793, Garden Valley, CA, 95633-0793. Include your email and phone number and Mignon will confirm receipt, and tickets will be held at "Will Call". 10:00 AM: Welcome by MC Drew Woodall. 04:30 PM: Miwuk Dancers & Close. 10:00 AM- 12:00: Naturally Native: Women at the Drum. Hosted by SELU & Thoz Womenz. 07:00 PM-10:30 PM: (Doors open 6:30) Evening BENEFIT CONCERT featuring BLACKFIRE, LAWRENCE LAUGHING and GOOD SHIELD AGUILAR, at the IOOF Hall. $12 Advance Tickets, $15 at the Door, $5 for Youth. Calif Native Plant - Free plants, etc.